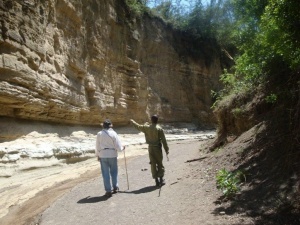 This day tour takes you to Hell's Gate National Park near Lake Naivasha. Search out herbivores and birdlife on a walking tour and learn about conservation at the Elsamere Conservation Center, once home to Joy Adamson. You'll begin with a drive north towards Lake Naivasha. Stop along the way to take in breathtaking views of the Rift Valley before proceeding towards the lake. On arrival you'll visit Hell's Gate National Park. This 70 sq km park is one among few National Parks in Kenya where walking is permitted. The park has many herbivores and birds to spot as well as hot springs, spectacular cliffs and gorges to explore. Lunch at a restaurant is an opportunity to sample regional cuisine and engage with the locals. With stomachs full head to the Elsamere Conservation Center on the shores of the lake. This was once the home of Joy and George Adamson who devoted their lives to wildlife conservation. They are famously remembered for their relationship with the lioness Elsa, having reared her from a cub and released her back into the wild. After a full day of explorations return to Nairobi.